Recently my brother got me Commando 2: Men of Courage, (2001). It’s pretty fun although the controls don’t hold up compared to modern games being both non-intuitive and clunky. However what really struck me about the game was how it treated the Second World War- as a grand stage where a cast of colorful characters did their stuff. Many games are set during World War II (although as of late we are getting many war on terror games)—this is nothing new as it is a very important part of our history. How we retell our history is critical in understanding how we see the world. History, or at least the formal study of history, is more than a list of things that definitely, really happened in a set order. Rather, it is a process of piecing together different parts and seeing how they play in to each other. This study, historiography, is how we come to a ‘finished’ history. No history, no matter how detailed, can ever really cover everything. Just think about your own personal history, how complex and meaningful parts of it are to you and try and explain that to a stranger who not only hasn’t mean you, but doesn’t even exist with the same cultural understandings that you do. In historiography there are different way to look at the past. For a long time it was seen as a record of the state. Things like kings, queens, battles, and laws were seen as what matters in the past, thus that history is a long list of how states do things. This style of writing history is sometimes called “mentalite,” or mentality in regards to how groups thought of during periods of time. While being in the second half of the twentieth century a movement in historiography that focused much more on personal histories, sometimes called “Annaliste.” Founded by Lucien Febvre and Marc Bloch (Arnold, 2000). Neither of these exist as standalone ideals either. Nor are they good or bad innately. Oh certainly you will have badly done history in both of these schools of thought. However, at the end of the day we shape our perspective of the past when we turn to history. We make ‘history’ while we live the ‘past’. This is not to say that history is merely some collection of jingoist stories that we tell ourselves. Rather, like all endeavors, the process of crafting it, by its very nature, shapes it. So when we talk about the past as history we must then be aware of the message that we are sending. In this case, what message the games we are playing are sending, by selecting what parts of the historical record to emphasize. To ensure clarity I want to again point out that this is not innately good or bad (though it can be used for good or bad ends), rather something that simply can’t be escaped. Even so, games are not history books (I know, I make the boldest claims), nor are they, generally speaking, for informing people about history as one of their objectives, though some do try and show case history a little as with Assassin’s Creed or to a more extreme level Oregon Trail. Thus they form a kind of mythic history for past events. Even if they are not doing so purposely, this bits do end up coloring the events of the past in to a narrative. The next logical question is: if games say something with their history (and the mythology than they then craft from it), what then do they say? Well the first and most obvious response to that is that different games say different things. Often influenced by the genre of game in question, even if an RTS and a FPS borrowed from the same history, just by the change in perspective between the two, you would end up with a different mythology between the two games. So we arrive to the idea that what a game says about the past is not only based on the type of history used but also the mechanics and design of the game as a whole. So then to limit our discussion let us pick apart a single game, Commandos 2. The protagonists are a British unit of commandos. The team sees combat in both the Europe and Pacific theaters during WW2. This immediately limits the scope of the history that the game can draw from. For example, with this set up the North-African campaign isn’t featured at all. But in 1942 British commandos assisted in Operation Torch, it’s not like the game is saying that Operation Torch didn’t happen. But by casting the spotlight on other locations, other locations and events get left out. Again this isn’t bad, it’s just something that players and consumers of media need to be aware of. Even if one was to try to do so it would be infeasible to make a computer game that covers everything and everywhere at once. The other big sweeping limitation of this is that by following the British, it binds the war to 1939 to 1944, though Commandos 2 takes place over 1941 to 1944. Why might this be an interesting tidbit? Because I am the one writing this I get to answer that question with a question. When did the Second World War start? Was it in 1941, with late in the year the US joining the war, making it more of a ‘world’ war? Was it in 1939, with the start of hostilities in Europe? Was it in 1937, with the Imperial Japanese invasion of China sparking off the Pacific theater in part? Any of these I would accept with a proper explanation of course. If you are from China your answer is likely going to be different than if you are from Britain – neither is right or wrong rather each just looks at different histories. Therefore by setting the game in that framework we reinforce a picture of the war that focuses on the Western powers, not bad per se, it is just how it is. China’s own drama with how the war would set the stage for the Revolution of 1949 is left out. Even though the protagonists are in that theater. But even beyond that in to the nature of what type of game, whether it is an RTS, FPS, squad-based, plays a part in creating its own personal mythology of WW2. This is a war where great things hinge on a few exceptional people. This was true during parts of the war and not true during others. In most cases the war relied on many people doing great things. However because we only see what the camera allows, the few great people are often all we can see. Games and other types of media, shape our mental concerns. With that being said, not all at once, playing violent video games isn’t going to turn a person in to a violent criminal. There is a correlation with each other as violent people tend to like violent games. It is worth observing however, that violent games can make a person more aggressive in the short term. Aggressive behavior is not the same as violent behavior (APA Task Force on Violent Media, 2015). Over time, they can still change how we perceive events. This is where we get to the core issue of the ‘camera.’ Since the game can only show so much, some things must be left out. However if these same things keep getting left out in time they will be forgotten in popular culture altogether. APA Task Force on Violent Media. (2015). Technical Report on the Review of the Violent Video Game Literature. American Psychological Association. Arnold, J. (2000). History: A Very Short Introduction. Gosport, Great Britain: Oxford University Press. 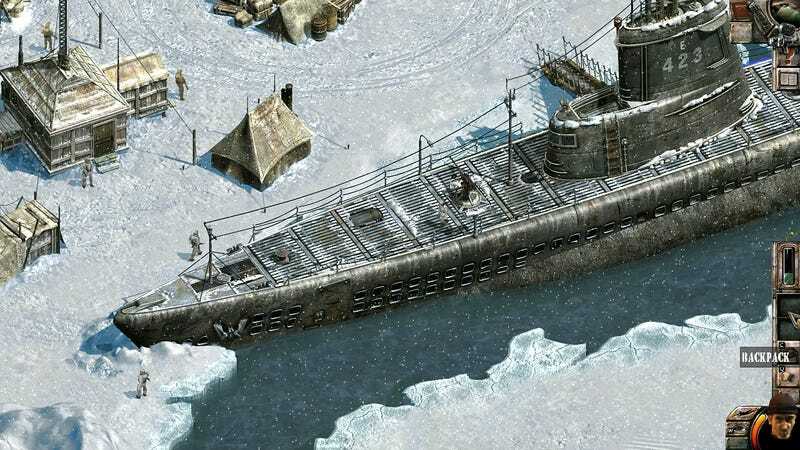 The screenshots in this article where taken from the Commandos 2 steam page (There where technical issues with my own).